WASHINGTON — The unpopular health care proposal supported by President Donald Trump and House Speaker Paul Ryan couldn't get enough Republican votes to pass the House last week, but Mick Mulvaney, Trump's budget director, chalked it up Sunday to Washington's being "broken" and questioned the Republican Party's ability to govern. 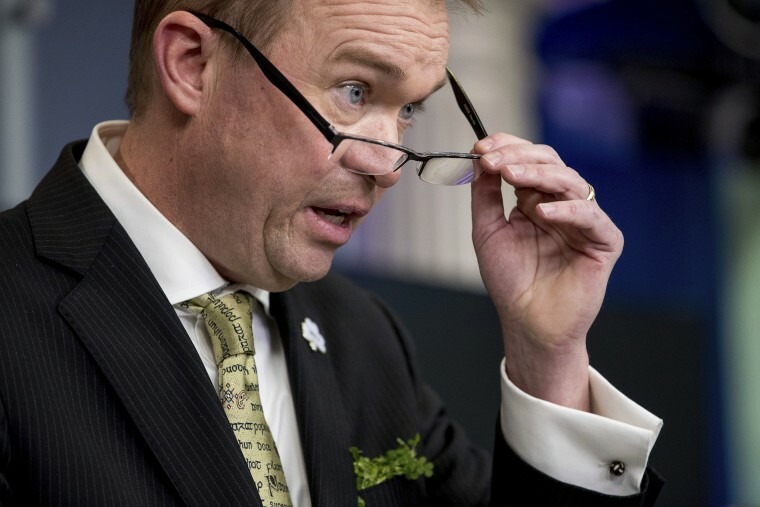 In an interview Sunday on NBC's "Meet The Press," Mulvaney, director of the White House Office of Management and Budget and previously a U.S. representative from South Carolina, bluntly acknowledged that Trump's team may have misunderstood the complicated process of legislating. There's "plenty of blame to go around," he said. "What happened is that Washington won. I think the one thing we learned this week is that Washington is a lot more broken than President Trump thought that it was." Mulvaney was a founding member of the House Freedom Caucus, many of whose members opposed the legislation. He said he had "no idea" why his former colleagues couldn't get on board — despite their repeatedly having explained their issues with the bill. "You could blame it on the Freedom Caucus if you want to, but there's also a lot of moderates — Charlie Dent [R-Pennsylvania] will be on your show in a little bit — who are also against the bill, and so it's sort of the powers that be in Washington that won." About three weeks ago, Ryan, R-Wisconsin, and other House Republicans unveiled their legislation to partly repeal and replace the Affordable Care Act, and Trump worked to convince hesitant Republicans that it was the right way to dismantle the law. But they couldn't scrape together enough votes, which handed some grass-roots progressives an early victory, as well as raised questions about the negotiation skills the president promised would break through the gridlock Washington is famous for. Asked why they couldn't pass a bill when Republicans maintain control of the presidency, the House and the Senate, Mulvaney posed a clear question. "Is the Republican Party capable of governing? I know the man in the White House is capable of governing. I saw it this week," he asked. "We haven't been able to change Washington in the first 65 days," he added. "And I think if there's anything that's disappointing and sort of an educational process to the Trump administration was that this place was a lot more rotten than we thought that it was." Asked whether repealing and replacing the Affordable Care Act was still a priority for the administration's first 100 days, Mulvaney was straightforward. "No," he said, "because we've moved on to other things." When the bill was pulled Friday, Trump blamed the lack of support on Democrats. But earlier Sunday, he started to pin blame elsewhere, tweeting that "the Freedom Caucus, with the help of Club For Growth and Heritage, have saved Planned Parenthood & Ocare!" Saturday, Trump also tweeted a tease to watch Jeanine Pirro's show on Fox News, which ended up opening with a dramatic call for Ryan to resign. Mulvaney noted how much time he spent with the president as they tried to negotiate the health care package, saying, "Never once have I seen him blame Paul Ryan, so I'm not sure what that was about last night." "The people who are to blame are the people who would not vote yes, who would vote no," Mulvaney said. "The folks who voted no are the folks who are to blame." One of the lawmakers who would have opposed the bill had it gone to the Senate was Mike Lee, R-Utah, who told "Meet The Press" on Sunday: "They were not far away from a deal. They could have gotten a deal." "Devoting 17 legislative days to a bill and then walking away from it because it hasn't passed within 17 legislative days makes no sense," Lee said, "especially when this is something that we've been campaigning on for seven years and the American people are hurting." Mulvaney tried to brush away criticism for moving on too quickly from health care. He said that he saw 120 members of Congress travel through the White House in the last few days and that the "there was absolutely no stone left unturned" as the administration tried to shore up votes. Trump has claimed he will now wait for the Affordable Care Act to "explode" before his administration addresses health care legislation again. Lee said the bill didn't pass because it "didn't deal with the most fundamental flaw in Obamacare: the part of Obamacare that has made health care unacceptable and unaffordable." The Congressional Budget Office released an updated score for the bill on Thursday, predicting that premiums would decrease for younger people but increase for older people. To try to win more votes from more members of the Freedom Caucus, the White House worked to negotiate some last-minute changes, including the elimination of some so-called Essential Health Benefits. Dent, one of the more moderate Republicans to come out against the legislation, told "Meet the Press" that those kinds of changes were "all to placate people who are not going to vote for the bill anyway. And by doing that, they ended up alienating more people on the center-right, or moderates. That was really what happened." Dent also wouldn't deny an anecdote from The New York Times Magazine reporting that Trump accused him of "destroying the Republican Party," saying Dent "was going to take down tax reform — and I'm going to blame you." "I'm not going to deny that," Dent said. "I listened very respectfully to what the president had to say. But my bottom line is this: This discussion has been far too much about artificial timelines, arbitrary deadlines, all to effect the baseline on tax reform. "This conversation should be more about the people whose lives are going to be impacted by our decisions on their health care," he said.